Moving your beverage from R&D into commercial production is exciting, but it can also be intimidating. There are hundreds of interconnected steps and decisions that go into every beverage’s production journey. The stakes are high as you build the team that you trust to maintain the consistent quality of your beverage. Here are some of the terms and ideas you’ll encounter as you prepare your beverage for production. Mastering this terminology will help you better understand the process and prepare you to communicate more effectively with your contract packers and manufacturing partners. The rotational force used to apply a closure to a bottle finish during capping. Proper torque ensures that the bottle will stay sealed during unexpected conditions or varying temperatures and humidity. The practice of bottling a product at ambient temperatures without tunnel pasteurization or hot filling and without the use of preservatives or cold sterilizing agents. The products are only briefly heated before filling. Aseptic filling can be used for both still and carbonated beverages. A process in which the manufacturing of a finished good occurs across multiple vessels, equipment, production lines, and personnel. Unique formulations will provide step-by-step instructions as to how to produce the best overall liquid per batch, sometimes referred to as batching. Parts on a production line that need to be changed out to accommodate different product or packaging sizes. Change parts can be found on the filler, labeler, or backend of the packaging line. Change parts add flexibility to a production line, but they can also be costly. The process during which a container is pressurized by cooling the product to a temperature between 30 and 60 degrees Celsius. Then cold product is added to a cold container. Cold filling is common for fresh products including juice and milk, and aerosol applications such as sodas and other carbonated beverages. The analysis performed to determine how corrosive a beverage is before it can be put into aluminum cans in order to properly line the cans with the protective coating that prevents corrosion. Can manufacturers and most contract packers will require can warranties to be achieved through corrosion testing prior to producing the finished good. Most corrosion testing will result in 6-8-month warranties. FIFO is the acronym for First-In, First-Out. FIFO is a cost flow assumption often used to remove costs from the inventory account when an item in inventory had been purchased at varying costs. Under FIFO, the oldest cost of an item in inventory will be removed first when one of those items is sold. The level to which liquid is filled into the container on a consistent basis. Most bottles have the fill line halfway up the neck of the bottle and most cans are filled just under the lid. Manufacturers strive to have consistent fill lines during production to ensure that each finished product is the same. A set of sequential equipment used by manufacturers to fill a beverage into a container on a commercial scale. Filling lines are often referred to as bottling lines or canning lines depending on the type of packaging being used. Many production lines are multi-use and can run various sizes and materials (glass, PET, etc.). Some also adhere stickers, labels, or sleeves to containers. Utilizing manual labor for the case or carton packing process. Hand pack is used when a facility does not have an automatic machine that can run in-line. Most hand packs involve variety packing, specialty packing, or specific labeling. Attaching a decal-like, reverse-printed label, consisting of adhesive lacquer, ink layer, protective lacquer and release paper, onto a container through heat and pressure. Heat transfer gives the impression that the decoration is part of the container. The process by which a liquid is heated and injected into a container and then inverted, allowing the heat to sterilize the container. After the heat cycle, the content is cooled before being transferred to the final container and sealed. Hot Filling is often found in facilities filling PET bottles but can also be used in glass bottles and cans. The loss of product from the time it enters the factory as raw materials to when the finished product is packaged and shipped. Liquid loss is expected and should be accounted for in production. The average liquid loss in the market can be between 3-5%. Larger batch sizes typically see less liquid loss than smaller batches. Also called a contract proof, allows for a preview of the output of a commercial print job. The colors approved in the proof are expected to be rendered identically on the finished product. A short run on the printing press in order to verify what is to be done on a production run. PSLs require pressure to form a bond between the adhesive and the product. No water, solvent, or heat is needed for the label to stick to the product. PSLs can be easily applied and easily removed and consist of a face stock and adhesive. They are printed and delivered in roll-form and can come in a variety of materials, colors, and sizes. Preservation methods are processes used to insure shelf stability of a product. Common methods include tunnel pasteurization, hot filling, and chemical compounds. Other methods include flash pasteurization, aseptic/extended shelf life (ESL) filling, high pressure processing, and velcorin. An arrangement in a factory where something is manufactured by passing through a set linear sequence of automatic or manual operations. Examples of operations in a beverage production line include batching tanks, filling lines, pasteurization, packaging, and palletizer lines. The point in time when analytical data has been reviewed to confirm compliance with the product description, specifications, and lot uniformity, for all products. The data can be gathered through onsite co-packer testing, or through offsite third-party testing. Some facilities have their own quality standards that must be met for quality release to occur. The process required for quality release can add a two-day to two-week hold on the distribution of items after production as micro-reports are generated and reviewed. Samples gathered at various stages in production. An example of typical retains during a production could include two samples collected from the beginning of the run, two from the middle, and two samples from the end of the run. The retains are kept on hand for testing and review if there is a quality issue or recall. The quantity of an order for purchase or production. Some contract packing facilities stipulate a minimum run size. Run size decisions are also made when considering order costs vs. the cost of holding inventory. The process of gathering the reputable data required to meet the requirements of government regulatory agencies and retail partners. Shelf life testing can take between 12-18 months, whereas accelerated shelf life testing takes 6-8 months. The process through which pre-formed sleeves (normally PVC) are slipped over the container in-line and then shrunk in a heat tunnel or allowed to relax onto the bottle. Sleeving can go over glass bottles, PET bottles, and cans. Sleeving verse printing directly onto cans can save time on artwork proofing and relieve full truck load minimum order requirements. Are you ready to go from beverage idea to production? We’d love to help ensure that your journey is smooth and successful. 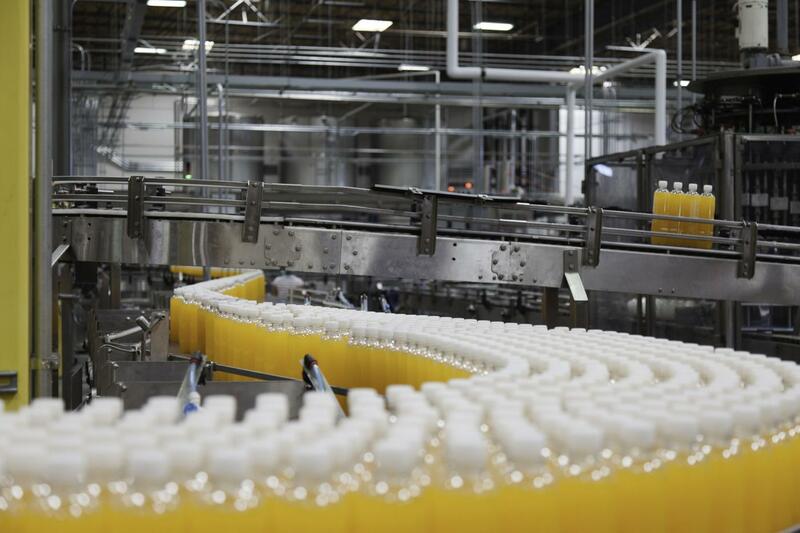 Contact us to learn more about how to put our beverage production expertise to work for you.